Want to master Linux? Right now, Gizmodo readers can save 91% on 6 actionable training courses and learn the ins-and-outs of the Linux OS. The Linux Learner Bundle has a range of content tailored for both Linux/UNIX beginners and experts alike. 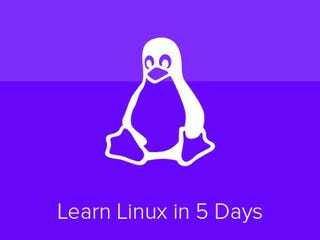 You’ll get a comprehensive, working knowledge of all things Linux - from setup to security - with 50 hours of in-depth instruction.The combined cost of all 6 courses is over $600, but Gizmodo readers can get the whole bundle for just $49 - that’s 91% savings. If you’re just curious about Linux or want to brush up your skills on this flexible operating system, don’t miss out on this great eLearning bundle.